Gratitude. It’s a word often spoken at this time of year, especially as Thanksgiving draws closer. Festive autumn décor prompts expressions of appreciation, and even holiday social media countdowns encourage thankful thoughts. But the practice of gratitude is not one that should be reserved solely for the holiday season, and perhaps no one thinks about this more than parents. Moeller isn’t alone. According to a recent survey, 92 percent of parents believe that in today’s social-media focused world, nurturing positive character traits – like honesty, generosity, compassion and kindness – in young children is more important than ever. Ryan Swanson, another mom of three in Atlanta, Ga., agrees wholeheartedly. She recalls her frustration at her son’s third birthday party, when he was more focused on the gift than the giver. “He was so fixated on the toy in the shiny package that he would rip open the tissue paper without waiting for me to read the card to find out who each gift was from,” she says. 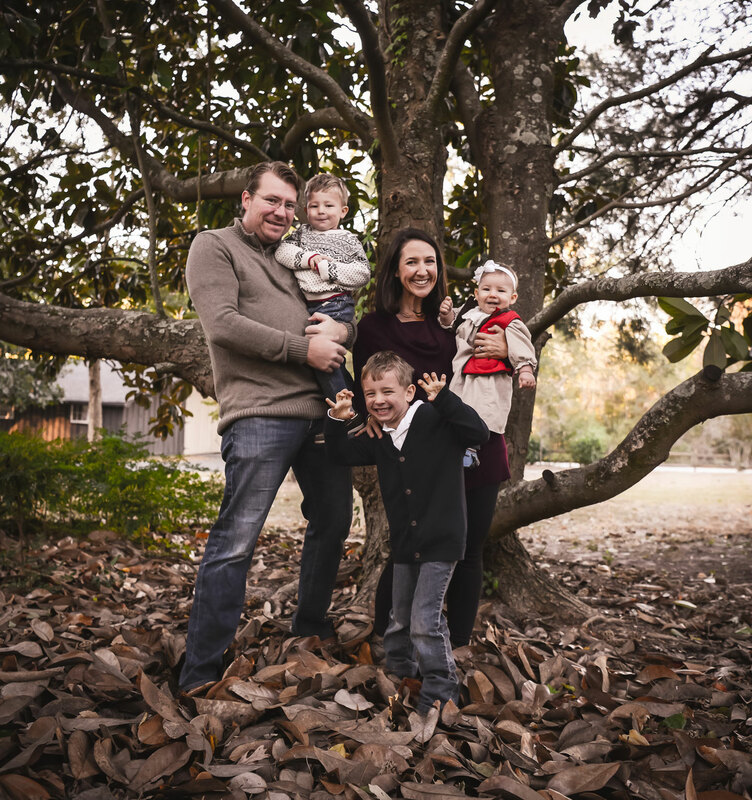 Ryan Swanson and family in Atlanta, Ga.
For Debbie and Bobby Deskins, Tampa, Fla. parents of a six-year-old daughter and twin three-year-old boys, developing values and traits like thankfulness in children is sometimes easier said than done. “You want them to be happy kids, but you also want to create that personality trait where they’re not going to freak out when another kid has a toy they don’t have,” Bobby Deskins says. As any parent knows, teaching good manners is one thing, but genuine gratitude? That’s another hurdle all together. 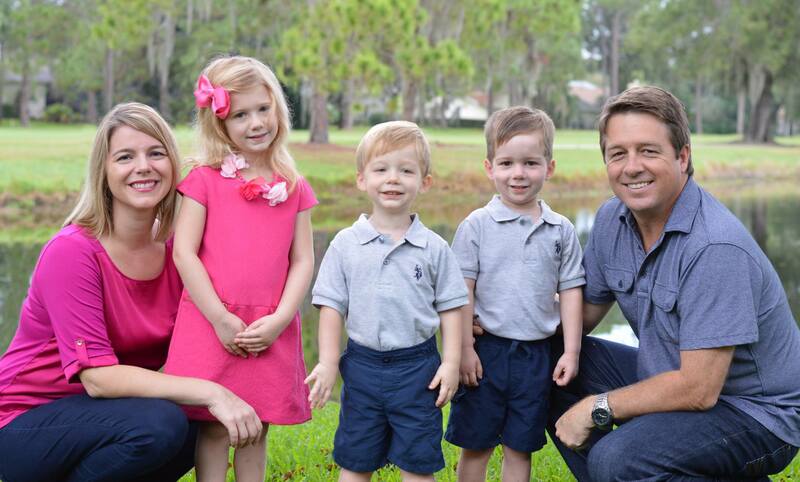 Debbie and Bobby Deskins in Tampa, Fla. teach gratitude through sharing and modeling thankfulness at home. According to experts, parents like Moeller, Swanson and the Deskins working to teach their children gratitude at a young age are laying the foundation for their children’s future success. Gratitude is not just about raising a polite child. The trait has been linked to higher levels of happiness, self-esteem, empathy and a host of other valuable attributes. “The traits that embody character – compassion, gratitude, cooperation, generosity, empathy and respect – are what empower children to rise above the trials and tribulations they will face throughout their lives,” says Jo Kirchner, CEO of Primrose Schools®, a national early education and care provider. Primrose Schools CEO Jo Kirchner believes it's never too early to start teaching character education. And when it comes to developing thankfulness in children, experts say it’s never too early to start. In fact, the first five years of life play a pivotal role in shaping their social-emotional well-being – and their success later in life. “Since then, we’ve noticed her giving toys to her little brothers saying, ‘now we all have one!’ and then looking to us for approval,” says Bobby Deskins. Like many things, gratitude is a learned skill. And thankfully, it’s one that parents can proactively teach their kids to set them up for a lifetime of gratitude. Kirchner recommends the following ideas for how parents can instill gratitude in their children. 1. Establish a gratitude ritual. Engage children in a regular thankfulness activity, like counting blessings at bedtime, or having family members name something they are grateful for before dinner. 2. Model gratitude. Actions speak loudly. Simple things like remembering to express appreciation to your spouse for taking the garbage out, or thanking a restaurant server, makes gratitude a normal part of your family. “We try to lead by example – always saying ‘thank you’ and ‘I love you’ to the people we care about,” says Moeller. Another tip: make eye contact and express your thankfulness genuinely, so your little copycat will learn to do the same! 3. Say “thank you” to your child. Expressing genuine gratitude to your child is just as important as modeling it. As parents, it’s easy to criticize or correct bad behavior, but it’s even more important to show your appreciation when he or she cooperates, shows kindness or is helpful. Not only will this reinforce good behavior, it will also nurture an attitude of gratitude. 4. Write thank you notes. Encourage your child to write thank you notes for gifts he or she receives or to a teacher or friend for doing something nice. Younger children can draw pictures to show their appreciation. “Not only will the recipient be touched by your gratitude, but you and your child will feel refreshed remembering the kindness that inspired your note,” says Kirchner. 5. Read books about thankfulness. Books about gratitude are a great way to help young children relate to new ideas. Kirchner recommends Little Critter: Just So Thankful by Mercer Mayer, Biscuit is Thankful by Alyssa Satin Capucilli and Pat Schories, and I’m Thankful Each Day by P.K. Hallninan. 6. Give back together. Volunteering as a family can raise children’s awareness of others’ needs. “We donated coats and scarfs this week to kids who don’t have what we do,” says Moeller. There are other ways to extend these lessons in generosity as well. For example, instead of volunteering at a local food bank, families can host their own food drive at home. Have your children earn money through chores which they can use to buy food for those in need. As a family, develop a shopping list, go to the store and deliver your donation to a local shelter or food bank. In the days that follow, discuss how food banks and shelters help people in their community. 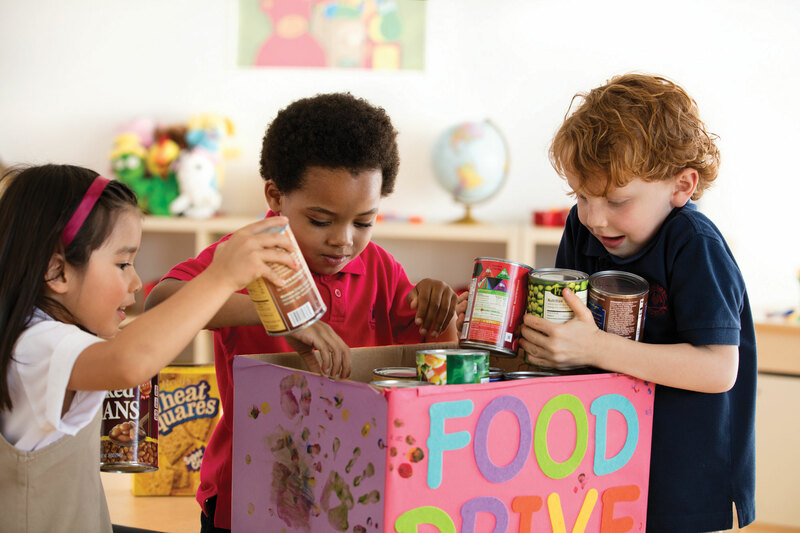 Primrose schools hosts a Caring and Giving Food Drive every year to reinforce an others-centered mindset. “During this season, gratitude is on many people’s minds, but giving thanks can be a year-round practice,” Kirchner says.